When you come to think about it, Mar Roxas probably has one of the most impressive résumés among candidates on the road to the 2016 elections. Roxas is the scion of two powerful families in both politics and industry (lest we forget that Mar is the son of a Senator and the grandson of a former President, and is also the grandson of the man who built the Araneta real estate empire). He’s an Ivy League graduate: he is an economist from the Wharton School of the University of Pennsylvania. He spent years as a financial hotshot in New York, making a name for himself in the world of capital and investments. He’s a former Congressman, a former Senator (garnering the most votes for any candidate in a national election, at that), and held three different Cabinet positions under three different administrations. While other prospective candidates have to blow smoke (like, say, turning the Philippines “into Makati”) to curry favor among the people and win their votes this early (at least one had to figuratively/literally blow someone’s rocks off), Roxas is—on paper—the most qualified. One may even say that he’s destined to be President: a man born and bred to be in Malacañang. Rightly or wrongly, Roxas has a very clear advantage among others through his position of privilege. The problem is, that’s not exactly how Roxas is packaged. And as it turns out, it’s a really big problem. It’s a different sort of blowing smoke altogether for Mar Roxas: to use an “advertising” analogy, it’s the problem of established premium brands who try to sell themselves to a market that can’t afford to buy them. Not that it can’t be done, it just reeks of “reverse pretentiousness” of sorts. The pitfall often comes when the item is placed on a very masa context: it’s what the brand aspires to be, but all too often it just doesn’t work out too well. Without careful thought, the whole thing either looks weird, or it leaves a bad taste in the mouth. “Looking weird,” I think, is the least of Roxas’s problems. Over the past few years, the portrayal of Roxas stands in stark contrast to his personal background and public service record. In previous elections, Roxas is a “man of the people:” attuned to the needs of the struggling masses, empathetic to their struggles and hopes and dreams. Maybe part of his own political successes came from that: the man, after all, still holds the record of the biggest statistical success in the popular vote. But all that never really changed. Roxas’s public image eschews all reference to his blessed and privileged background, and embraces the trapo-ness of all that surrounds him. 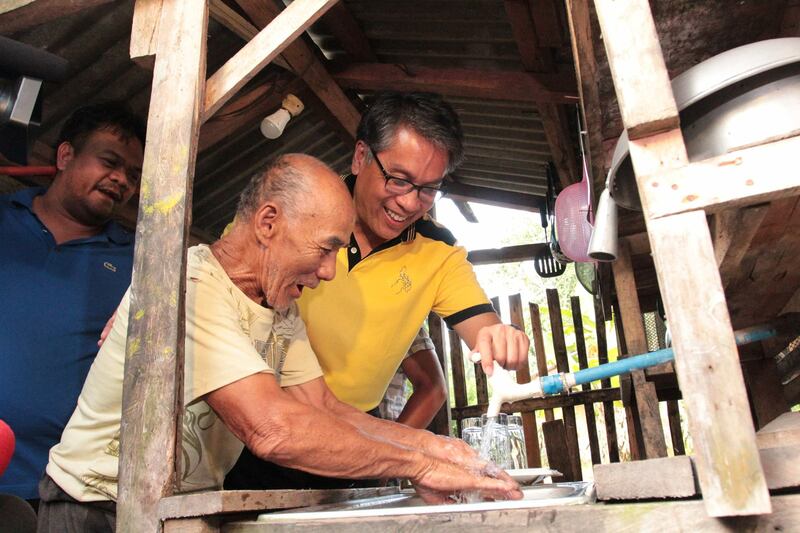 Mar Roxas is a baby-kisser, an MRT rider, a palengke-shopper, a tricycle-rider, a dancer, a sako-bearer. Roxas is just-your-average-Pinoy who, unlike average Pinoys, doesn’t really know how to do average things. I know it’s not the proper word, but it just feels… IDK, slightly ratchet. For all the jingles and monikers and “kilig” moments that his wife Korina Sanchez proffers on national television, Roxas is just that: droll, boring, a bit of a middle-aged milquetoast. Whatever charisma he had in previous elections has given way to the ravaging of experience: the white hairs and fine lines that come with the Senate and the Cabinet, among other things. Not that there’s anything wrong with being boring, but there is something wrong with the image-building. The last time Roxas insulted the mothers of corrupt politicians before a crowd of ardent supporters, the word “odd” was putting it nicely: it’s like the guy never cursed a day in his life, and fails to grasp the gravity of “t*ngina.” The last time Roxas alluded to metaphor, the delivery stank more than the heads of garlic he brought along as props: Roxas never really needed actual herbs and spices to bring the heat on a Constitutional Assembly. The last time Roxas went to a marketplace, it was less of the classic “Mr. Palengke:” he had all the countenance of—and this is putting it mildly—a dead fish: Roxas has bigger fish to fry. What makes all of this so problematic for Roxas is that the carefully curated “man of the people” thing is not really him. We all know that Roxas doesn’t need to ride the MRT or a tricycle, nor does he do his own shopping from wet and decrepit palengkes. We all know that the guy doesn’t need to wield a hammer or carry sacks of construction materials. Those are territories best left to his rivals and opponents: for people like Jejomar Binay to eat in boodle fights to wash all taints of corruption, or for people like Grace Poe to randomly point at MRT coaches to present some semblance of technical knowledge. Binay has to harp about being a “human rights lawyer,” while Poe has to invoke her father’s memory from time to time. Roxas’s rivals come into the game with very clear disadvantages against him, and therefore have to play the tired old trapo game: that while politics is the province of the wealthy and the educated, wealthy and educated people like them (insert tired anecdotes about poverty here) are ready to speak for the poor. Roxas simply doesn’t have to do that. And he shouldn’t. And there’s the bad taste in the mouth: people see right through it. We chuckle inwardly at the stereotypical “rich kid” trying to bag a few groceries or repair a school chair, but we get miffed at Roxas because we know what it’s all for. I’m sure that Roxas may be genuinely interested in learning carpentry or selling fish, but that’s all a distant priority compared to the Presidency. Would he be doing all of these if the stakes were not this high? When you have a political résumé as impressive as that of Roxas, you don’t need contrived ways to “reach out to the people.” Rightly or wrongly, democracy embraces the idea that we should be governed by people who are better than us. If we’re objective about it, people like Roxas completely fit the bill. Not because they break bread with us, but because people like him know how to get that bread to every Filipino’s home. More importantly, what Roxas is doing now is something that his rivals can probably do better. When taken to the level of desperate condescension, doing “people things” is a necessary thing for trapos. You don’t see trapos in slums everyday, pointing to brighter futures or carrying children on their shoulders: you see them doing all of those things (and then some) only in election season. Unless Roxas wants to further sink in the trapo traps, he has to do less of it. Or maybe be a more “people things” kind of guy when he actually wins in 2016. Roxas’s rivals can’t hold a candle to him, if qualifications (and only qualifications) mattered: the education isn’t there, the experience isn’t as up to par, the service record isn’t as strong. And rightly or wrongly, they don’t carry his political pedigree. Roxas should be that: himself. He should make the media rounds and share his expert opinion on the state of the economy. The dad-shirts have to go, in favor of Presidential couture. He has to stop the song-and-dance numbers and dramatic skits, and play to his strengths as a straight-laced economic expert, public service veteran, and a man who is probably genetically wired to be the President. If the Presidency is his destiny, he should start acting like it’s his, and claim it not only in words, but in actions. In short, he has to be a Roxas to be President Roxas. Looking at all of his qualifications—without knowing of his commercials or Facebook pages—you might say that Roxas is the “thinking vote.” Roxas best articulates what the “middle class” desires for in a President. If we are really a nation where affluence grows and traffic is a sign of progress, or a country where choices in white bread are more important than rice supplies, then we need people like Roxas. And if this is Roxas’s last chance at being a President—knowing that this is precisely the chance he gave up on in 2010—then he shouldn’t die on the hill of jingles or dances or random finger-pointing. He should be who he is: the Wharton-educated New York investment banker with political pedigree and over 20 years of experience in public service. Now whether or not we’re the kind of country that needs someone like Roxas is a different story altogether. More on that when I feel like it, I guess. I agree that Roxas definitely needed an image overhaul, especially with how he tried one trapo antic after another, just to be more palatable to the masses. But I think the problem is that, even if he is the most qualified, he would have problem getting the votes if he do not go the “trapo” way unfortunately. People I know do really want to get rid of the trapo politics. However, one has to admit that with most Filipinos, the trapo antics still do get their attention, and sadly, their votes. Unless we can change how we select candidates for government positions, then we will see more trapo dancing and pseudo-makamasa acting. I appreciate the insight you offer that Mar Roxas should just be himself, act and dress like his resume. But the problem I observe with your writing is that is is SUBJECTIVE. And in the end you reveal a hint of what you really think of Mar Roxas. You don’t like him, hence the subjectivity, i.e your likes and dislikes. You read too much into his actions without validating them, such as when he drove nails into a chair. Or when he carried a sack of rice. Privileged as he is, we forget that he lived and studied abroad. He didn’t have yayas there to cook and wash for him, he things by himself, as most people living in the states do. I lived 6 years in europe and I had to learn to do everything. So I get where Mar is coming from. You speak your mind from a vast lack of experience and information. You source your judgement of Mar from your own limited knowledge of the facts which is why you missed the CONTEXT, the key to knowing the truth behind actions and thoughts. We are shaped and molded by our experiences, our upbringing and our environment. The context. When Mar slid on a muddy trail while riding a motorcycle, people AGAIN read it wrong, thinking it was a media stunt. The context leading up to that photo (which was taken by a bystander with his camphone and there’s an eyewitness account to back this up), was that all roads leading to their destination were blocked by storm debris, trees, poles, roofs, etc. which rendered their 4-wheeled land vehicles useless. But Mar discovered a shop that leased or sold motorcycles so he initiated using those bikes to get to where they needed to go via back trails through the mud and brooks. Dangerous but effective and successful. Along the way his bike slipped on mud, something which happened to other members of his group. When Mar nailed that chair and lifted that sack he WAS being himself. The problem isn’t with him, it’s with YOUR POINT OF VIEW. You’re looking at him from the wrong angle and with insufficient information. For crying loud, you should interview him personally in order to ADD to your point of view. Otherwise, your writeup of him can be dismissed as too personal by those who know him better. As a journalist and seeker of the truth, you owe it to yourself to know more and not just what you’ve gleaned from your obviously limited sources. From what I’ve read of your article, it would seem that you’re getting your info on Mar from newspapers. Are we not defined by our actions? then look at what Mar has done. The BPO industry. Does it not benefit tens of thousands of people it employs? I know because I worked 6 years for a BPO company and I can tell you from a personal standpoint exactly how it does. Was it elitist of Mar to have put this BPO vision into action and worked to make it a realty? It brought 18.75 Billion dollars into the economy last year. It currently employs about 1.2 million Filipinos. The annual income and the number of employed is projected to continue growing exponentially. Is Mar being a hypocrite to have his picture taken with BPO employees? From what you wrote, you would think so. The Generics Medicines Law. Does it not benefit tens of thousands if not millions of Filipinos? While as DTI secretary, Mar first tried out his vision by making generic medicines available at selected government hospitals’ pharmacies, giving patiets quality but cheaper medicines. the overwhelmingly positive results spurred him to eventually legally allow its use everywhere. The Cheaper Medicines Act. Does it benefit the rich and elite? There are medicines for our vital organs which are simply not available in generic form. Mar strongarmed these Pharmaceutical giants into slashing their prices by half so that these medicines can be placed within the reach or more Filipinos. There’s more where that came from but I get the feeling that you wrote about him without really looking into what he’s accomplished and for whom. You have failed to look at the body of his work and focused on your shallow, subjective opinion of the man. And you pass judgement on him. May I say that we are all liars. We fail, we cheat, we steal. We lie. Be real. It’s the truth. And I’m no better than you. I’m probably as guilty as you are or worse. Sure, Mar may be rich enough to avoid stealing. But he’s not perfect, he’s had his failures and he’s made mistakes. But he did not let allow his shortcomings to prevent him from accomplishing everything he’s done so far. And he’s not even the president yet. And as you’ve also hinted at in your article, yes, he’s probably much better than you or me, put together. Based on what he’s done in his career, his shortcomings are better than our strengths. But that’s me saying that. Mar never would. he is more real than what you have project him to be. You misunderstand him and that’s sad because facts are objective, but opinions are subjective. Please project your opinions as opinions and facts as facts. So here’s the thing: there’s a disclaimer here somewhere that says this is a personal blog, so all of these are opinions presented as opinions. There’s no pretense here of objectivity or “new media journalism.” And I think it starts here: see, Sir, I’m *not* a journalist. I just own this website, which isn’t a news site. My point of view does not constitute the truth of Roxas at all. It’s just that. So I think it’s kind of clear that I have the call to write things down as I see fit: there’s the trigger warning. Now I think – and this is me being subjective – what you read was as fair as my shallow and subjective view of things would allow. And while I do appreciate what you said to illuminate Roxas, I should point out that those things are known to me and don’t escape me. This is a question of Roxas’s image, more than anything. Would an article praising Roxas – or any candidate, for that matter – to high heavens been objective? Now as to the matter of interviewing Roxas, we non-journalists don’t really have access to “interviews” but this much I can say: I have met Roxas before, on quite a few occasions since 2010. And a lot of that frames my POV of Roxas. And you can ask more than a few guys within Mr. Roxas’s circle about what I think of the guy and they’ll probably say the same thing: it doesn’t take a lot to convince me that Roxas has it in him to be President. So to answer the request, yes, the opinions are presented as opinions. Wharton is the business school of Penn. The problem with Mar Roxas is he wins, Korina Sanchez will become the first lady. Personally, I don’t like Korina, so I will not vote for Mar. You know what role the first lady does! Jenny, I did not (notice the past tense) like Korina either because of what I’ve heard about her or what she is perceived to be–until I got the chance to meet her personally. With all the negative perceptions in my mind, I was pleasantly surprised to find that she really is a nice person and down to earth. You’re probably saying”Of course, she’s being nice. Her husband is running for president”. And I don’t blame you. I probably would have said the same thing if somebody told me what I am telling you. But, I had a chance to meet with her a couple of times after that and I still find her quite nice. A person who is antipatica and trying to appear nice, at one time or another, will slip. As we say in Pilipino “dumadaplis”. But to this day I haven’t seen it. Also, I am not alone in this. Several of us have had the same chance to get to know her and we all seem to have had the same experience. Initially negative about Korina only to realize she’s not the unlikable person she’s been perceived to be. While some women may brag that their spouse will only wear a signature watch, Korina, with a hint of pride, told us that her husband, Mar Roxas, refuses to wear a signature watch. This is not to convince you to vote for Mar Roxas even if you don’t like Korina. But think about it, if, tragically for our country, Binay wins, our first lady will be Elenita. Does that sound like a better option? Given his track record in politics…. ask him to write, in one page his accomplishments as congressman, as senator, as cabinet secretary and show it billboards or in tv… so the people may know… then let the people decide come May 2016. It’s inevitable. Mar will be the next president and Binay will go to jail! Filipinos will move on! Yup, it’s Korina i’m a bit worried about.